With the Minolta Bizhub 454e Copier you will be able to streamline the crucial tasks of copying, printing and scanning. This highly useful machine features a high level print resolution and is able to deliver around 45 pages per minute. 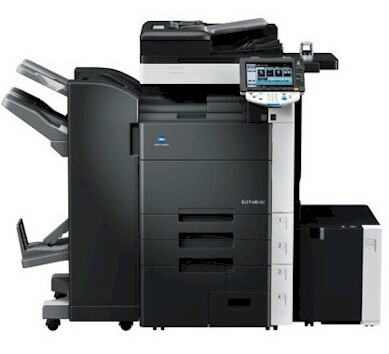 Known to be the most advanced multi-functional copier of Minolta, the Bizhub 454e Printer can be easily connected to mobile equipment. In order to protect the private documents of any organization, the Bizhub 454e Printer offers certain multi-layer solutions. High-end technology and extensive creative applications of this printer works flawlessly with the device that it is connected to it thereby, leading to the delivery of outstanding results. This machine not only delivers high-end results but is also impeccably fast. Delivering consistent high performance, the Minolta 454e Copier, Printer and Scanner will be a fine addition to the line of technically advanced equipment in your office.